Recently we’ve been hearing about how cold it’s been over much of North America, for example how Houston saw its earliest snowfall on record! Well, it appears that the early wintry conditions are getting set to take even stronger hold over the Northern Hemisphere. In Europe, the continent has experienced a very warm summer and fall so far, but that is about to change rather dramatically — should the latest computer model generated weather forecasts pan out, and which they are expected to do. 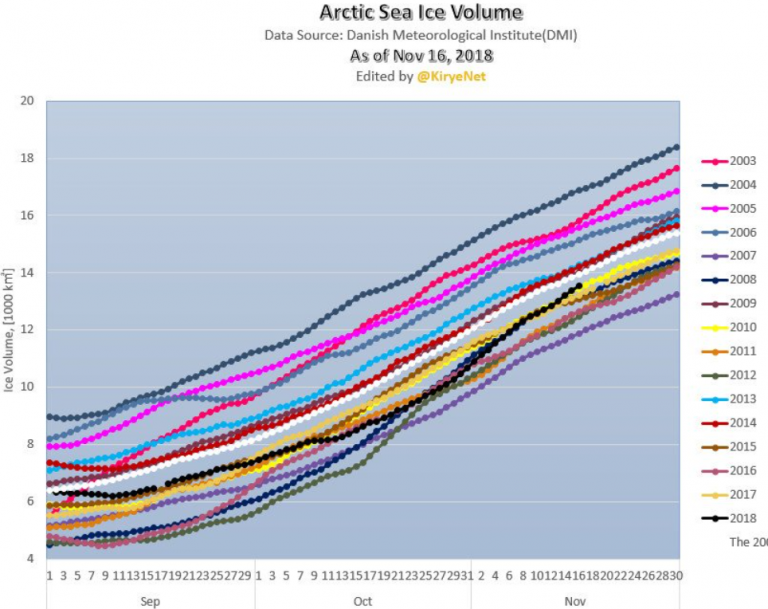 Also Japanese skeptic blogger Kirye at Twitter sent me chart showing Arctic sea ice volume is back up to normal after having been a bit below normal over the past couple of months. 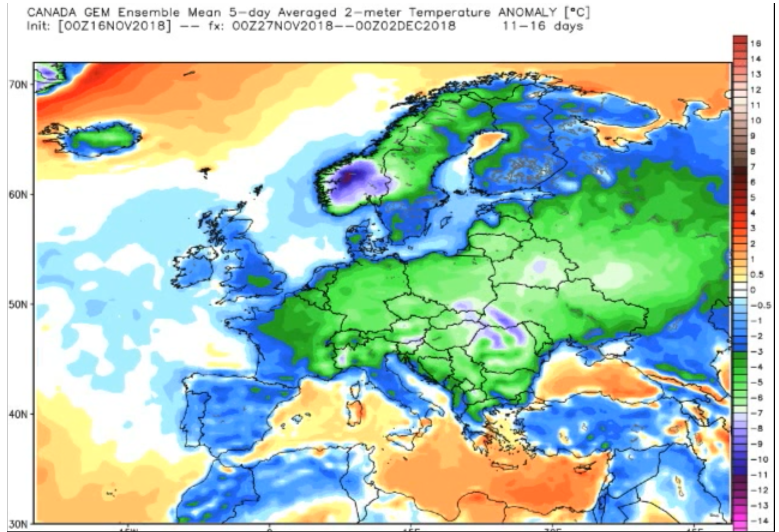 Once again expect another rollout of the scientifically bogus explanation of a Arctic-warming-induced perturbed jet stream causing all the cold. Just keep in mind this is barely a hypothesis that has no data to back it up and that it mostly relies on phony models created by climate activists. Although the globe may have warmed about half a degree, much of the Northern Hemisphere land mass will continue to see cold snows winters like it did 50 years ago. The earlier idiotic alarmist predictions are proving to be merely fantasy visions of hysterical minds. Best of luck guys. I live in central Indiana. Thursday night it iced all night long. A 1/4″ (6+ mm) covering everything. Many deciduous trees still had a lot of leaves and the extra weight of the ice they held resulted in more limbs falling than if they had been bare. The Pines folded up like an umbrella from the weight on their bows. Electrical service lost in many places. Traffic lights out all over. Both local hospitals on emergency power. 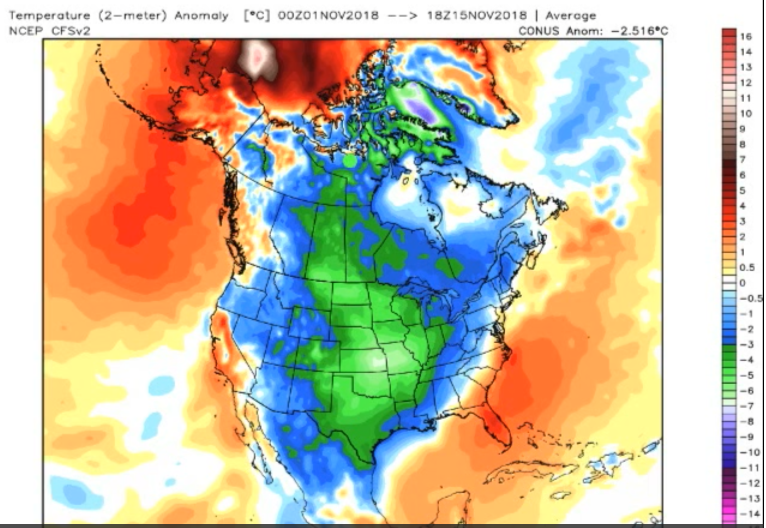 Joe Bastardi and the guys at weatherbell started forecasting this winter to be a tough one since early this summer and it sure looks like they’ve got it right. 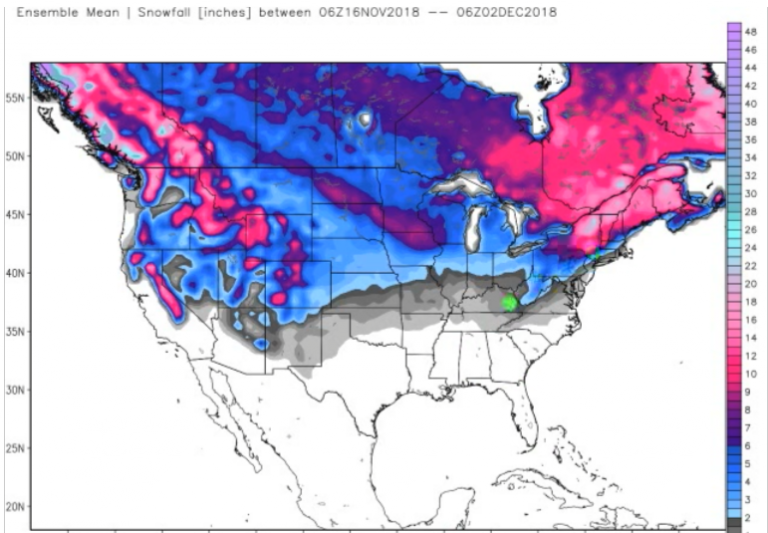 Meanwhile the usual brain dead alarmists are out in force claiming the relatively though early winter conditions have been caused by us humans. They can’t forecast or project anything accurately but you can count on them crawling out of the woodwork to claim it’s all industrialized humans fault after the fact. Nothing can falsify CAGW/human caused climate change “theory”. Thanks for this wonderfully graphic account. I don’t envy you – so far autumn has been pretty “warm” over here in Germany. But the cold is going to hit us too – soon, too soon. I believe in global warming, I mean I wish it were happening, but unfortunately it isn’t – not in a big way, not like I wish it would – Arizona temperatures in Berlin, I’d love that. Was stationed at Flint Kasserne, Bad Tolz for three years (1986-89) and prior to that had been in Germany several times TDY for training. As a cold weather/alpine warrior I am very familiar with your winters and your mountains. Skied all over Bavaria. Loved it. Don’t take this wrong but your winters are just not as cold as many other places I trained in my 12 years as an SF soldier. Cold in different places has different characters even when the temperature at each place is the same. For example New England cold like one finds in Upstate NY, Vermont, etc is just plain hurts more. It’s more biting than the equivalent I experienced anywhere in the Alps. I know this may sound like I’m nuts but it’s the truth. You don’t sound like you’re nuts to me at all. You’re very observant and good at graphic writing, offering an interesting observation, from someone who obviously knows what he is talking about. What I am saying is that -15C in the Alps is not as dangerous or hurtful as -15 C in the Green Mountains of the Vermont or White Mountains of New Hampshire or a place like Ft. Drum, NY. Windchill, relative humidity, etc being equal. The character of the cold between the two places is quite different. I spent time living outdoors in the dead of the winter in both of these regions. Based on my experience to find the cold of the character of that of New England in Europe one has to get well up into Norway. Another place I spent some time living in the cold. I cannot define it for you in terms of weather metrics of any kind. One just has to live in for days at a time to understand where I’m coming from I guess. This impression was gained by 5 1/2 years of winters spent training in New England and 3 years doing so in Germany and Europe from Sud Tirol, Italy, Austria, up to Dumbas, Norway. I think there is some truth in this cold at higher latitude is worse than cold at higher elevation because if you are at higher elevation you just take shelter but if you are at higher latitude then you have less solar radiation and shelter will not offer the same protection just think of what happened to the Vikings in Greenland during the little ice age. I was always taught that how cold it felt was a function of wind speed and direction as well as relative humidity. Soviet diplomats hated postings to London because it was “so cold”. The difference was the humidity. Dry cold feels less cold than damp cold. So I’m told! I don’t pretend to be an expert. Talk about cold. My place – Manitoba- is -21C this morning, with a wind chill of -31C. Normal is -2C for today. We have been way below normal (average) for Sept/Oct/ and early Nov. My Mom used to say that it is so cold that even the weather won’t go outside. Yea and this hoosier wishes you canucks would keep it but knows your going to share. It’s going to be a long hard winter. Stay warm. Now I’m going to build a fire in the fire place. That’s so funny – and I learned two important terms, into the bargain: hoosier and canuck. Daily, I read blogs from the USA, the UK, Czechia, Germany, and OZ – with comments from all over — (all written in English). Slang and idioms from other places provide lots of learning experiences. I was raised in western Pennsylvania, without much exposure to the great wide world. Idioms and colloquialisms are part of what make language interesting. Gross Gutt! I agree with you guys. To me, language is among the most fascinating leads left by mankind from which to judge where our efforts at being civilised have been taking us. I take my clue from Sir Karl Popper who identifies the functions specific to human language (as opposed to the functions of the language of [other] animals) as what makes humans humans. The argumentative function; we can argue about the quality and truthfulness of a description, and develop refined and powerful methods of ascertaining truth/plausibility. This gives rise to another function specific to human language: the critical function; we can use our language to understand and criticise one another’s thoughts. At this point man has arrived at objectivity – he can turn his inner reasoning into an object for assessment by other humans (note objectivity of which man is capable is not to be confused with absolute and final truth but with findings/propositions/hypotheses subjected to the most rigorous testing). At this advanced point man has effectively developed a hyper-intelligence that connects the brains and thinking of billions of human beings. This makes us a lot more knowledgeable and reflected than any other species. I love it: “it is so cold that even the weather won’t go outside”. Yes, and there is chagrin in New York City, earliest snowfall in Central Park since 1882. Unexpected, it gridlocked the city. Kenneth & Pierre , I wish you wd consider doing an article on the 5G grid. It is, after all, an atmospheric phenomenon, and appears more lethal to birds and humans than the birdchoppers. Many birds dropped dead of heart failure when it was tested. Geese held their heads underwater until they drowned. As Democrats get ready to re-infest Congress, Joe Bastardi very much wants to testify to the fact that the weather his team forecast months in advance is NOT climate. Piers Corbyn could also point out the errors in their ideology. Of course, because the Democrats have no desire to exposed as scam artists, they wouldn’t listen even if they did call on meteorologists who forecast from first principles rather than resorting to a crystal ball or relying on doctrines of misplaced faith. I’ll update the DMI Sea Ice Volume numbers for the 17th: The volume increased again, and is now at 98.23% of the 16-year values for the day. The increase was 191 cu km, 163.83% of the increase of the average. Currently, the volume is 248 cu km less than that average, and 97.75% of the average graphed using the DMI’s 10-year reference period 2004-2013. As mentioned in the article, the Sea Ice volume is now ‘normal’, having recovered from lower levels earlier in the calendar. Today, 20 million metric tons of coal will be burned all over the world. Every coal-fired power plant across the Northern Hemisphere is pumping out electricity like there is no tomorrow today. Mongolia produces 98 percent of its electricity from coal. The Mongolians are at work right now making sure the power plants are cranking out electricity. 100 million barrels of oil will be burned by 7.6 billion humans. It’ll happen again, just like yesterday. Burning oil like there is no tomorrow is what people are doing in the most postmodern world out there. Eventually, those two resources, called fossil fuels, lord knows why, will become depleted to the point where it may be cause for concern. You can see where the warmistas fuel their fire, the hypocrites. They’re going ape-nuts doing their best to be chicken littles and crying wolf until hell won’t have it. All that CO2 being carelessly emitted into the atmosphere by people so wastefully doing so is an outrage and we’re gonna whine and cry until it costs everybody an arm and a leg. We’re gonna grouse about it until we get our way, even if we get stuck in the ice down in Antarctica on the AGW mission of a lifetime, that doesn’t matter. We are going to scream and yell until there is global warming once and for all. If fossil fuels aren’t doing it, well, then, by golly, we’ll do it all by ourselves. The global warming enthusiasts are just getting started and don’t know when to quit. Anthropogenic lies and propaganda do work, ask Joey Goebbels. If you can’t dazzle them with brilliance, greenwashing will do. Oil, the master resource, as they say, has 46 years of supply left to be burned. The demand will be there, don’t worry. Once the oil has been burned, gone, you’ll need more if you want to continue to do what you’ve been doing. First and foremost, you need the fuel, then the engine, then the work required to obtain the final result, problem solved. Rudolf Diesel built the engine and the fuel used was from peanuts. Rudolf didn’t need no stinkin’ rock oil. Besides, in the early days, the best a refiner could do was five barrels per day. Along comes John D.Rockefeller and everything changed. Enter oil, peanuts aren’t needed to fuel the operation. They’ll work, but oil is more abundant and plentiful. Oil it is. Rudolf’s engine is the bomb, so we’ll take that along with the oil. Produces great results. When it’s gone, back to peanuts, anything, canola oil, even. If you don’t want biofuels like alcohol from corn, drink it. Burning all of those fossil fuels is going to have an effect, something will change. Coal came to the rescue. First change to notice would be an improvement of forest biomes in Europe. Forests were no longer stressed by humans chopping down trees for wood for every need trees can provide. Forest management became a necessity, it seems. The Cedars of Lebanon became managed in the late 1200s, early 1300s. Coal became the answer for mankind to stop clearcutting everything in sight. It had to stop in California, but it all moved down to the Amazon where it is done Conehead style, in massive quantities. Takes a long time to learn a lesson the hard way. California’s forest management techniques need some serious improvement, changes. Governor Moonbeam is not a rocket surgeon. Sorry. Wood burns and if you want fire and wood is available, you will burn the wood, it is fuel for the fire. The Chinese have been tapping into natural gas as a fuel for centuries, been using it for about 4000 years now, so they got to the finish line first, and a long time ago. If you want to build a wall, hire the Chinese. It will last for a thousand years or more. Never argue with success. The Chinese built that great big dam, so they do know how. A group goes to work, works together and things get done. A 300-foot boom on a dragline gets things done, you can move the earth with one of those. Nikola Tesla got to work and built the ultimate 400,000 horsepower machine that got things rolling better than any rope or cable ever could. In Manitoba, 95 percent of electricity generated is from dams, hydroelectricity. There are trace elements in coal ash, so there are reasons to do tests on coal ash to see what is there. Uranium is one element in coal ash, there will be some work done there, or, has been work done, and uranium is extracted from coal ash. Nuclear power is fairly clean, so its use can’t be denied or ignored, provides a benefit. Forget about Chernobyl and Three Mile Island, we have been focused on Fukushima. The babushkas of Chernobyl wanted to go back home and they did. The wolves returned too. We all live in denial, we deny the very fact that we need to use the resources at our feet. If you don’t want to live outside in the elements in an unforgiving wilderness fraught with danger at all times, you build some shelter and hope for better days. Don’t really have to return to days of no electricity and no running water, nobody is going to be willing to do that. If I want an energy source like no other, the sun is the first choice. Even if only less than two percent of the sun’s energy makes it to the earth’s surface, I’ll take it all. Especially today. Cold, once again. As cold as it is today, leave it to the warmistas to argue that it is AGW once again at work. They’ll do it every time. They pound sand all day long and it doesn’t bother them one bit. I drive a big truck (tractor trailer) for a living now so I get around. Last year during our coldest time in Indiana it got down to – 15 F (-26 C). The high power electrical lines make a distinctive and quite obvious humming sound when they’re carrying their maximum load in that kind of cold weather. It was loud enough that I could hear it over the engine of the truck where those lines ran along side of the interstate. Yesterday at about this time I was dropping a trailer full of various auto parts at the Lear Logisitics warehouse in Whitby, Ontario, Canada east of Toronto on the north shore of Lake Ontario. Dropped the loaded trailer in a door and hooked to an empty trailer to bring back. On the way back early Tuesday morning I ran into my first decent snow of the season in SW Ontario and Detroit, MI. Tonight I’m home. In my driving job I am an on call driver. IOW I get paid a salary and have a company phone. They call me to go when they can’t get a load covered or a driver calls off or for some reason a regular driver isn’t available to take the load. I go where they need me to go, when they need me to go. And what that means is that often in the winter I take loads bound for places where bad weather is forecast. Thus I do a lot of driving in snowy weather or freezing conditions during the winter months. Lots of people that call themselves truck driver call off of loads their committed to when they find out bad weather is forecast along their route and that is job security for me. As the world cools, we are told either that it isn’t, or that it’s really because it’s warming that it’s getting so cold. No lie is too big or too small to tell. But their fraud is exposed yet again, and this looks like it might be a really big deal. The mother load of all his posts can be found here. If they are as damning as his most recent, they need to become common knowledge. The most recent article deals with temperature adjustments, and what a scam they are – something everyone needs to know and take to heart. Here’s the new development: A guy named John McLean has just (October 2018) published a big Report via John Boyle Publishing, essentially consisting of an expanded and updated version of his 2017 Ph.D. thesis for James Cook University in Australia. For his thesis, McLean elected to conduct an “audit” of one of the surface temperature records, that of the Hadley Center at UEA, a series known as HadCRUT4. The HadCRUT4 series is the main series relied on by the IPCC for its warnings of climate alarm propounded to the governments of the world. The full McLean Report is behind a pay wall, where it can be purchased for $8. I have purchased a copy. The Executive Summary and some other excerpts can be found at Watts Up With That here. The data tampering is real, and whether deliberate or just a result of incompetence (or a bit of both) the consequence is that we have no idea what the real temperature record is, and even less what we should try to do about it. The shambles they have made of climate science is an utter disgrace. A tremendous number of new record low temps are likely to be set later this week around Thanksgiving (Thursday). It is forecast to be the coldest November since at least 1982 for all of the NE US.